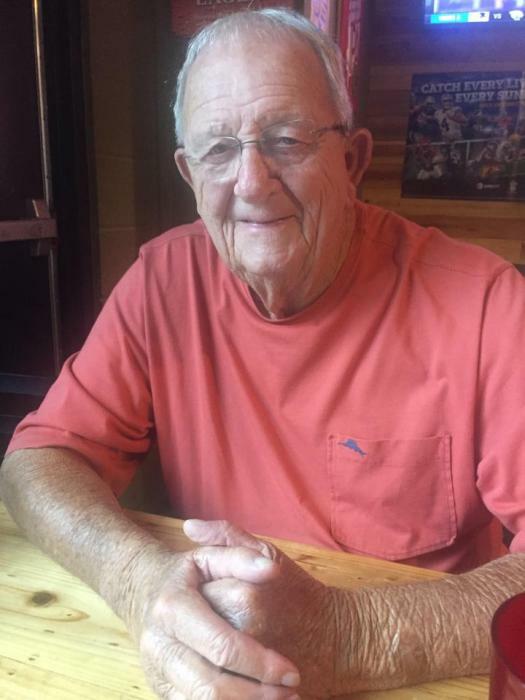 James Wilkins Yates, 79, of Apex, passed away November 19, 2018. He was born on September 13, 1939, to the late James Claiborne and Lily Wilkins Yates. Jimmy is survived by his wife, Sandra: his children Kim Massey (Todd), Todd Yates (Michelle), Melissa Love (Tony), Stacy Britt (Kevin); his grandchildren Chris, Brandon, Brett, Collin, Emory, Brooke, Camden; his sisters Doris Goodwin, Isabell Blackman and many nieces and nephews. Jimmy retired after 34 years of service with Duke Power Company in Durham and was most recently employed with Autopark Honda in Cary where he developed lasting friendships. He was a 32nd Degree Mason and active in Green Level Lodge #277 and was a member of the Amran Shrine Temple. Jimmy was a member of Olive Chapel Baptist Church in Apex. The family will receive friends Wednesday, November 21, 2018 from 10AM to 11AM at Olive Chapel Baptist Church. The funeral service will follow at 11AM. Burial will follow in the Church cemetery with Masonic Rites. Olive Chapel Baptist Church, 600 New Hill Olive Chapel Road, Apex, NC. Donaldson Funeral Home & Cremation is honored to serve the Yates family.